Unlike the posterior leaflet, aggressive resection of the anterior leaflet margin is not feasible due to anatomic constraints. Therefore the strategies employed for anterior leaflet prolapse are designed to correct prolapse without resection of significant areas of leaflet tissue. 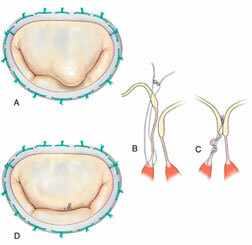 Very limited prolapse of the anterior leaflet can be treated by a small triangular resection of the prolapsed area followed by direct closure with interrupted sutures (Figure 1). The triangular resection should be limited to the rough zone so as not to compromise the body of the leaflet. Chordal transfer of a secondary chord to the free margin of the anterior leaflet is a versatile technique that does not require resection of prolapsing marginal tissue. After identification of a normal secondary chordae adjacent to the prolapsing area, the chord is detached 1 to 2 mm from its origin on the body of the anterior leaflet. 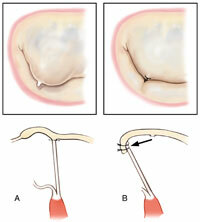 It is then re-attached to the free margin of the anterior leaflet in the prolapsed area (Figure 2). Alternatively, a “flip” technique of a small segment of the normal posterior leaflet can be considered. A small segment of posterior leaflet including marginal chords is excised and then reattached to the free margin of the anterior leaflet at the site of prolapse. Interrupted sutures close the defect in the posterior leaflet. Artificial chordoplasty is another technique commonly utilized to correct anterior leaflet prolaspe. A “neo-chord” is created by placing a polytetrafluoroethylene suture between the fibrous tip of the papillary muscle and the margin of the prolapsing segment. One of the difficulties associated with this technique is the determination of exact length of the neo-chordae that will correct leaflet prolapse without causing leaflet restriction. Several techniques of implantation have been described to overcome this hurdle. We use a “functional approach” to determine the optimal height of artifical neo-chord (Figure 3)1. Following ring annuloplasty, optimal chordal length is achieved by intermittently testing valve competency with ventricular saline injections. 1. Adams DH, Kadner A, Chen RH. Artificial mitral valve chordae replacement made simple. Ann Thorac Surg 2001 April;71(4):1377-8.